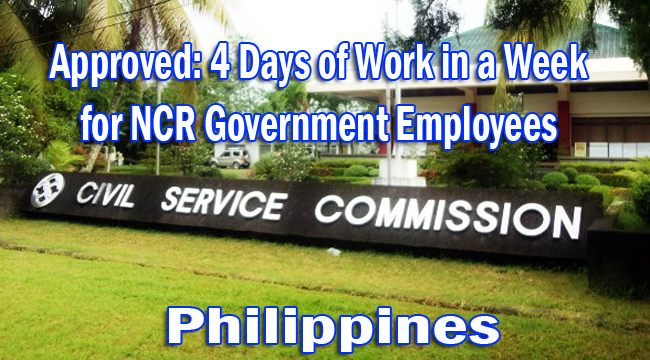 Civil Service Commission had approved the four days of work in a week that would begin on Monday. Employees would be able to work for four days and have a three day weekend each week. However good the offer may seem, this four days a week work is only offered to government employees who could work from Mondays through Thursdays or Tuesdays through Fridays. Due to the short schedule, workers would have to work from 8am to 7pm and/or two more hours of work a day. Offices would also need a call center to assist their customers. CSC says that the said change of schedule is to answer the worsening issue of traffic in the Metro Manila. Furthermore, employees could save money from commuting and spend more quality time with their loved ones and family. Employers’ Confederation of the Philippines have some disagreement with the newly implemented schedule. Eduardo Lacson said that the government agencies that are always needed by the private sector such as marina and Bureau of Customs. Our economy is not yet strong enough to afford the lesser days of work in the government agencies. CSC approved the four day work a week but people’s reactions are mixed as to its effectivity against traffic and its effects on the economy.